Right in front of the administration building at the West entrance of the University of the Philippines (UP) is a statue of a man facing upward with outstretched arms. It is the oblation. In an unveiling ceremony of a bronze replica, UP president Vicente Sinco said, "...we rededicate this center of education, for which this landmark stands, to a more determined pursuit of truth in whatever shape and form, to the promotion of academic freedom, and to a tireless cultivation of love for all men regardless of race, rank, and religion. May this figure be forever stand to move those who come to this University to brighter visions of service and loyalty...."
"It is an atmosphere in which there prevail 'the four essential freedoms' of a university -- to determine for itself on academic grounds who may teach, what may be taught, how it shall be taught, and who may be admitted to study." who may be admitted to study. Of course, these are not "anything goes freedoms". These rights are within the same frameworks that researchers subject themselves to: rigorous scholarly standards that determine both reliability and accuracy. Rules are set not by courts or legislators. Rules are set by the scholars themselves. And universities exercise this freedom. 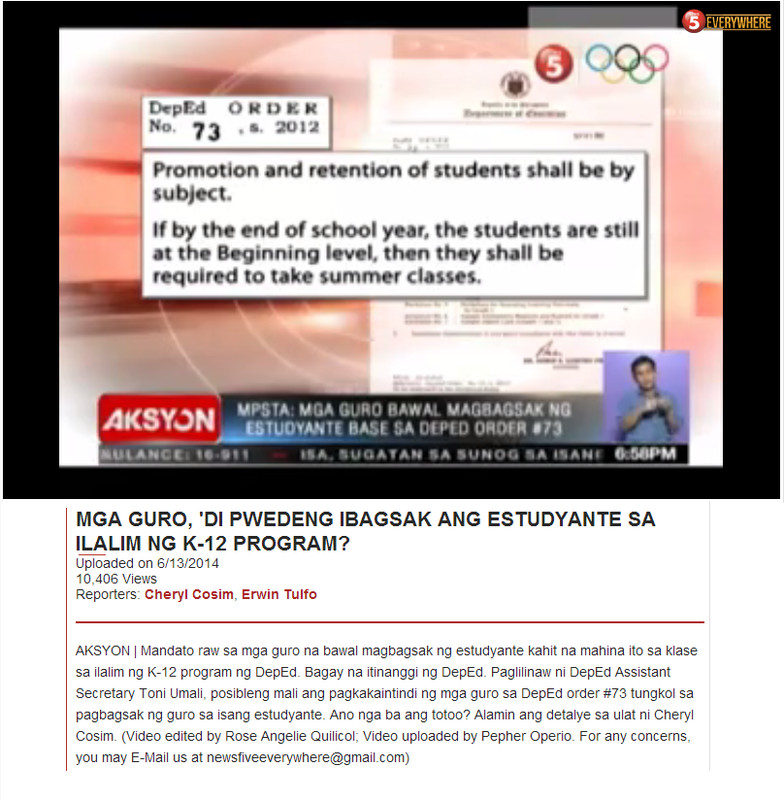 It is bad enough that there are courses mandated by law in the Philippines (3 units on the life and works of Jose Rizal). Now, there are sections in society that would like to continue mandating the use of a specific language. SABBATICAL NOTES. 23 JUNE 2014. MONDAY. N3. 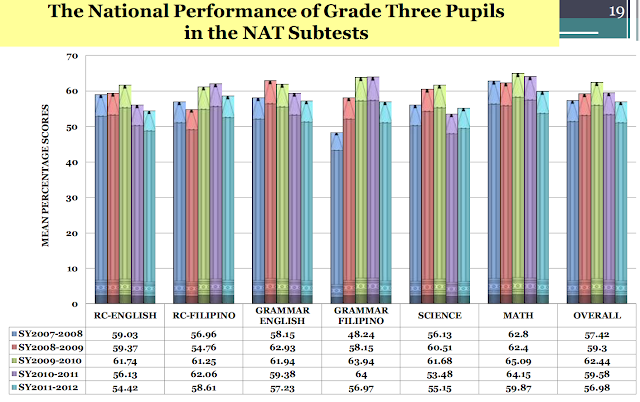 Linguistic asymmetry, the Philippine case. WHAT IS HAPPENING in the Philippines is this, and let us say it: many people are forced to learn one or two languages, but some other people are not at all required by the educational apparatus of the state to know something beyond what they already know in the language or languages they were born into. This is a clear case of linguistic asymmetry. Every Tomas, Diko, and Hari is made to learn Tagalog/Pilipino/Filipino but no one from the language community of Tagalog/Pilipino/Filipino is ever required to know something in Hiligaynon or Cebuano as mediated by Hiligaynon and Cebuano. The majority of the educatees of the Philippines go through the same ceremony and rite and ritual of doing the same thing, of knowing others, and never their own. We call this funny case an education in Tagalog/Pilipino/Filipino nationalism, but never a real case of nationalism that takes into account the diversity of peoples, languages, and cultures in the Philippines. It is hard to be educated in diversity when all we have known and understood is nationalism in a singular language. To accept diversity as our approach to the issue of national building and state crafting is to admit with humility that we made a mistake, and this mistake has been going on and on for so long. To accept that we are multiple is to understand that we can exploit this multiplicity and make this country great, and it will be great because it can afford to show the world that various peoples and communities and cultures, like the variety of things in nature and in the world, can exist together in peace, and they can exist together in peace because that peace is grounded on justice. 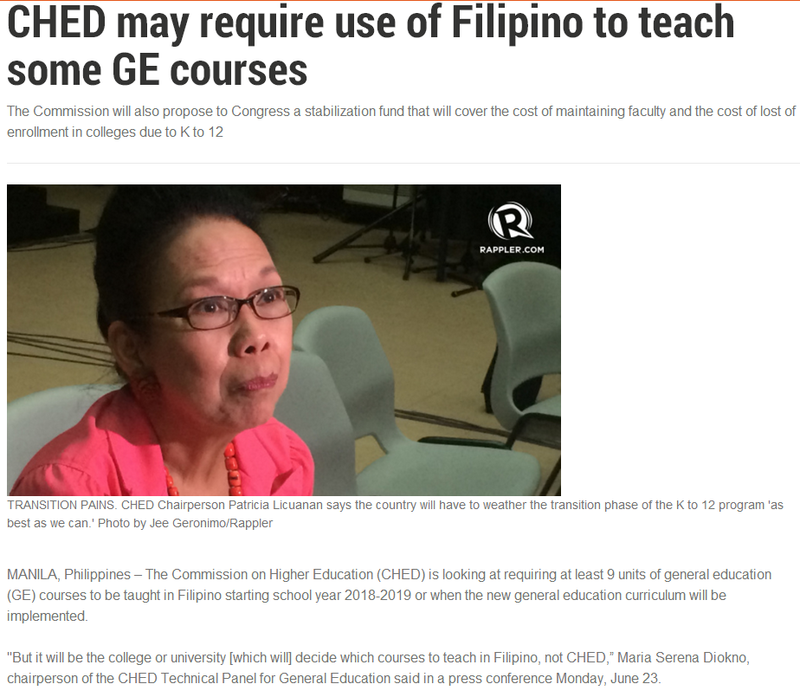 In a statement issued yesterday, CHED Chair Patricia Licuanan clarified that under CMO 20-2013, it is explicitly stated that the courses under the GEC may be taught in either English or Filipino. "Teaching the GEC curriculum in the Filipino language is not tantamount to teaching tertiary-level Filipino courses," Ridon said in HR 1249. Educators and students demand freedom. And this is only proper. And teachers must be empowered so that they could actually perform their task. And students should be free to pursue their love for learning. The government must provide the resources but the government must not dictate what should be taught and how it should be taught. This is the job for those who are in academics. Teachers and students cannot ask for greater autonomy and at the same time, demand for the government to prescribe a certain curriculum in higher education. Does the Computer Make Us Dumb? Can We Not Do Simple Math?